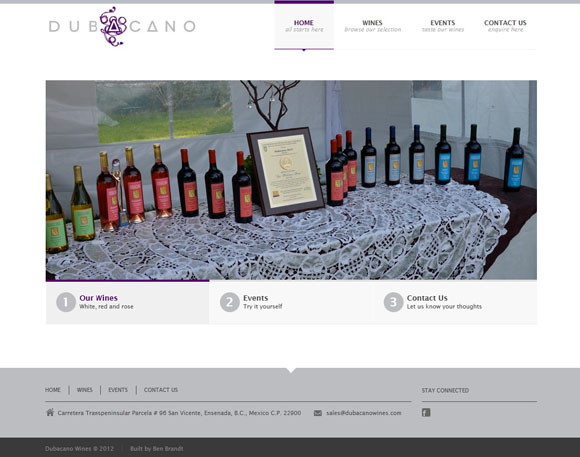 I recently built a website for Dubacano Wines, showcasing their wines and events, as well as building in functionality for allowing them to do event registration on the site in the future. It is a responsive site built on WordPress to allow them to update the site with their latest info easily, with minimal involvement on my end. You've got to love WordPress. Not only is it powerful and flexible, it's easy enough for clients to use and really take ownership of their site. Because in today's web climate, a site needs updates if it's going to be successful. So check out what they are up to, and you should really check out their wines! I can say from personal experience that they are very good. My personal favorite is the Merlot Rosado. Also, let me know if you have any thoughts on the site. I'd love to hear your reaction!